The average temperature for the year  was 0.69°C (1.24°F) above the 20th century average of 13.9°C (57.0°F) [ie 58.24F] , beating the previous record warmth of 2010 and 2005 by 0.04°C (0.07°F). Too stupid to spend much time on it … but so stupid it should be noted. “The scientists set up infrared heaters over the five meadow plots measuring 30 square metres (322 square feet). 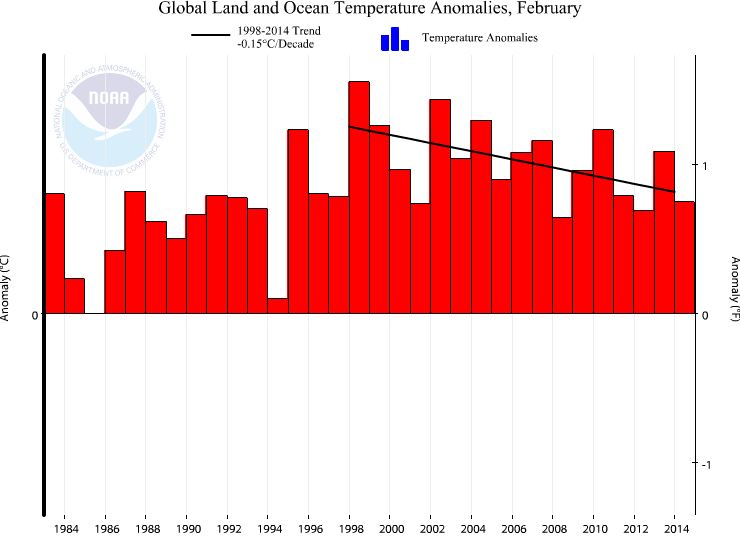 According to the NOAA, February 2014 was tied for 21st warmest with 2001. It was .45C colder than 1998. Brrr. But it was also colder than 1983 and 1987 and 1991 and only .1C warmer than 1973. 1973!!!! The trend for February from 1998 is down -0.15C/decade.